We’d love your help. 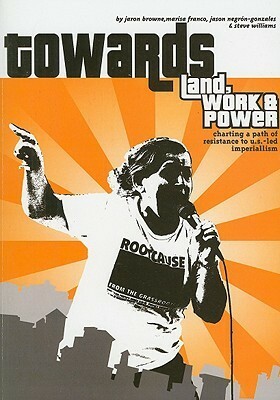 Let us know what’s wrong with this preview of Towards Land, Work & Power by Jaron Browne. After years of building a fighting organization of welfare recipients, domestic workers, shoe shiners, child care workers, security guards, unemployed workers and other no- and low-wage workers, the organizers and leaders of People Organized to Win Employment Rights (POWER) realized that we couldn't answer some basic questions: What is the nature of the world's political e After years of building a fighting organization of welfare recipients, domestic workers, shoe shiners, child care workers, security guards, unemployed workers and other no- and low-wage workers, the organizers and leaders of People Organized to Win Employment Rights (POWER) realized that we couldn't answer some basic questions: What is the nature of the world's political economy? How are our campaigns for racial, economic and gender justice impacted by neo-liberalism and imperialism? What will it take to build a movement in such despondent and challenging times? In 2004, the members of POWER's Committee for Working Class Leadership and Strategy decided to answer these questions. We wanted to make sure that we had the skills necessary to develop strategy for our own organization and to help to develop strategy for the movement. This book is the result. To ask other readers questions about Towards Land, Work & Power, please sign up. The first two sections of this book are a good summary of social tensions and working class struggle in the Bay Area. These sections are really a wonderful introduction to this history. The later half of the book is not worth the paper its printed on. It advocates movement towards some vague, very maoist and ill-concieved worker's party. So anyway read the first two or maybe three sections of the book especially if you're unfamiliar to the history of San Francisco Bay-Area and its struggles. It's been a while since I read the book. Although I'm not a fan of it, I still recommend it to Bay Area folks with radical politics just simply because it's a good conversation starter. The book gave me insight on some aspects of SF's political landscape. I should read it again however. The best part was the (brief) section about the history of city planning/ gentrification in SF. I guess I just expected it to be more about that stuff and less about a vague analysis of the global economic system, which I read plenty of in school and am slightly annoyed by. Maybe it's just me. This book is important because it shows the analysis of imperialism in one particular city, i.e. San Francisco. It may not be enough to be against prisons. I will think about being anti-imperialist. This is a great document of the macro and micro work of Organizing. It has a real motiviating narrative to view the world as it is, so you can work towards the world as we would like it to be through grassroots community organizing! The most readable explanation of the dynamics of imperialism that I've ever read -- incredibly applicable to our experience in this "global city." The title almost says it all, except that also, this book is written by the organization POWER in San Francisco, so they really know what they're talkin about. let's throw around the word worker and not actually define what a worker is. let's spit up maoist doctrine, and then say we're not the vanguard but then say we are the only ones who are right. I learned so much about Imperialism and the U.S. Highly reccommend. Its smart. Accurate. Sophisticated. Accessible.